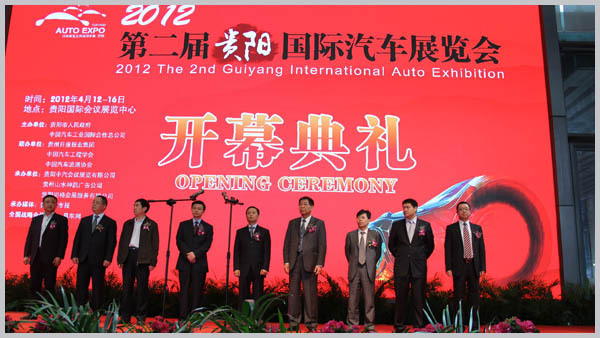 On April 16, the 2nd Guiyang International Auto Exhibition (hereinafter referred as ‘Guiyang Auto Show’) was successfully closed. It set new records in terms of exhibition scale, quality, service standards and sales, all of which determining the show’s leading position among automotive exhibitions of Guizhou Province. Guiyangmunicipal government played a crucial role in carrying out preferential policies, improving public transportation, and creating publicity environment for the Expo. Meanwhile, CNAICO as the host ensured the Expo a high quality with its rich resources, advanced concept as well as an experienced team. In addition, Guizhou Daily Newspaper Group and many other mainstream media facilitated timely information update and consultation, providing an efficient marketing platform. Influence of CNAICO as a famous exhibition host won the Guiyang Auto Show the world's top automotive brands. Ferrari, Maserati, Aston Martin, Lamborghini, to name a few, gathered in the Expo, and enhanced its quality and grade. The show was the first large-scale indoor auto exhibition held in Southwest China in 2012. Its influence reached to many Southwest cities. More than 20 new models made their debut here, covering both foreign and domestic brands. The ‘new car feast’ made Guiyang Auto Show a trend indicator in the region. The show focused on visitor participation and experience. Themed activities such as ‘Couple Visiting the Show’ and ‘Photographer alliance’ aroused enthusiasm, also presenting the theme of the expo "show the world • drive the local". As one of the largest and most influential auto shows in West Regions of China, Guiyang Auto Show has been moving steadily toward a first-class auto show in China. The Show was hosted by Guiyang municipal government and CNAICO, co-hosted by Guizhou Daily Newspaper Group, Society of Automotive Engineers of China and China Automobile Dealers Association. It was executed by China National Automobile Convention & Exhibition Guiyang Co., Ltd., Guizhou landscape verve advertising Co., Ltd., and Guiyang Sungoal Exhibition Services Co., Ltd, with Guizhou City news as hosting media.